Shoreham celebrate a goal last season. Shoreham Football Club chairman Stuart Slaney spoke of his relief after his side were finally handed the Southern Combination League Premier Division title earlier today. Mussels, who finished second in the SCFL Premier Division this season, have been handed the title - along with promotion to the Isthmian League for the first-time ever - after league leaders Haywards Heath Town were handed a nine-point deduction for fielding a player while under a 'sine die' suspension. The SCFL dished out the punishment at a committee meeting back in May, which Heath appealed decided to appeal. Following an appeal hearing with the Football Association at Wembley this morning - it was dismissed by the FA - meaning Mussels will be promoted. Having waited so long for a final decision to be reached, Slaney just feels an overriding sense of relief. He said: "This has been something that has gone on for almost two months, myself, co-chairman Ralph (Podger) and everyone else at the club are just pleased we've finally been promoted. "It's not been a great advert for non-league football, with the time it's taken for this decision to be reached, but we've got there in the end. "We can move forward with sponsorship deals now and Sammy (Donelly; Shoreham manager) should be able to get players to come to us with the attraction of Isthmian League football. 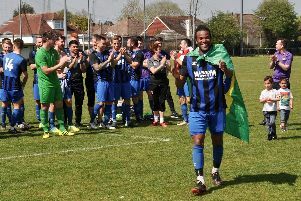 "The correct decision has been reached in the end, I wish Haywards Heath all the best for next season and hope to meet them in the Isthmian League the season after next. "It's a great moment for us at this football club and we want to keep progressing and moving forward in years to come."